Mix classic sparkle & modern design with this stunning bracelet from Mikey. 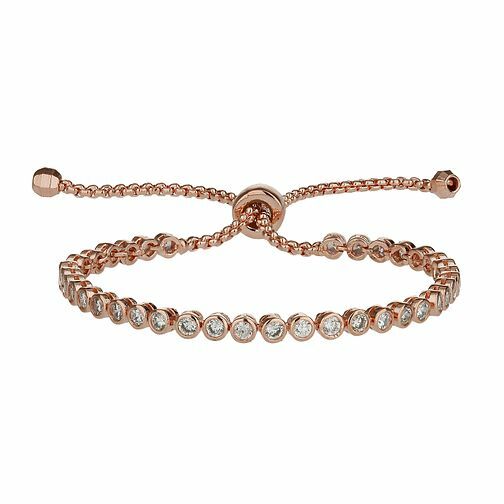 This self-locking bracelet features shimmering round cubic zirconias sitting in sleek, round rose gold tone settings leading to a simple knotted rope style chain. London based jewellery designer Mikey specialises in unique, wearable glamour for all occasions. Mikey Rose Gold Tone Cubic Zirconia Self Locking Bracelet is rated 5.0 out of 5 by 5. Rated 5 out of 5 by Anonymous from Looks beautiful Love this watch but I am unable to read the instructions re turning the watch on and cannot operate the watch strap. Could anyone help me? Rated 5 out of 5 by Anonymous from Bridesmaid gifts Bought my bridesmaids gifts from here. Amazing rose gold bracelet. Lovely quality for reasonable price. Over the moon.